A chapter in Lynda Resnick’s book Rubies in the Orchard: How to Uncover the Hidden Gems in Your Business is titled ‘The One True Copy of Jackie Kennedy’s Real Fake Pearls’. Resnick tells the story of how, in 1996, Sotheby’s auctioned the estate of Jackie Kennedy Onassis, including her iconic three-strand pearl necklace. It didn’t matter that the pearls were imitation, and that the young Jacqueline Bouvier had picked them up at Bergdorf Goodman for around $35. They were listed by Sotheby’s at $200–$300. Resnick was determined to have them, and persuaded her husband Stewart to bid all the way to the jaw-dropping closing price of $211,000. The couple were the subject of ridicule in the national press. But as owners of The Franklin Mint, they saw an opportunity. They toured the pearls around the country, promoting collector’s edition facsimiles of the necklace (including a ‘letter of authenticity’) priced at $200 each. They sold over 130,000. ‘Value is real, even when the product is 100 per cent fake,’ writes Resnick. The couple donated the real fake pearls to the Smithsonian Museum, where they are on permanent display. The story reveals Lynda’s singular awareness of the importance of emotional attachment in establishing financial value. 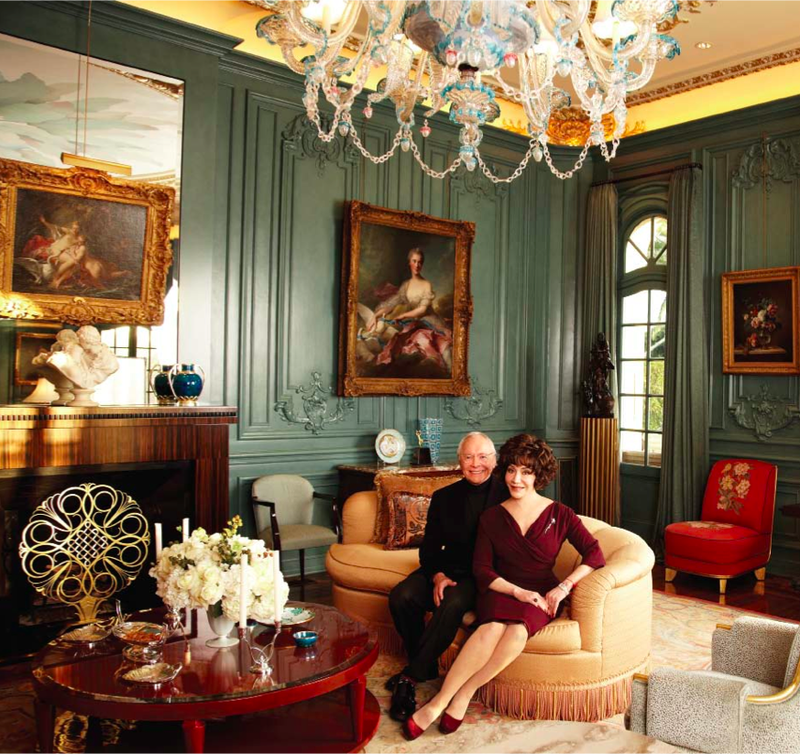 The Resnicks’ current portfolio of businesses – which includes POM Wonderful pomegranate drink, Teleflora, FIJI Water, Wonderful Pistachios and Cuties clementines (though no longer The Franklin Mint) – has thrived by engaging customers’ most deeply held desires in order to sell otherwise humdrum products such as water or nuts. The website for Cuties, for instance, consists largely of uploaded photographs and videos of people’s kids. The billionaire Resnicks are far from oblivious to the scale of their own privilege. ‘Giving back is a big part of our lives,’ says Lynda. ‘If you saw the contrast between the way that we live and the people we serve in [California’s] Central Valley and so forth it’s quite alarming. We do what we can to make their lives better. And also in Fiji, and, of course, in Los Angeles.’ Indeed, the couple are amongst the most prominent of the city’s philanthropists, and have been for years. Their most recent endeavour was the $53 million Resnick Pavilion at the Los Angeles County Museum of Art, which opened in 2010. ‘It was,’ she says, ‘the greatest thing of a philanthropic nature that I’ve ever been involved with in my life,’ although she grants credit for its success entirely to Michael Govan, the museum’s charismatic and visionary director. The Resnicks were famously hands-off during the planning and construction of the expansive, single-storey structure, which was designed by Renzo Piano in the style of the neighbouring Broad Contemporary Art Museum, also by Piano. Eli Broad, who sponsored the latter building, was reportedly unable to stop himself micromanaging its development, resulting in a far less elegant and flexible outcome than the Resnick Pavilion. It’s a typically pragmatic approach from a woman who evidently prefers to deal in facts and results than in speculative self-analysis. It’s hard, however, not to try and interpret aspects of the collectors’ characters within the collection itself. I am reminded of Jackie Kennedy’s pearls as Lynda, accompanied by her longstanding and erudite curator Bernard Jazzar, shows me what appears to be Hans Holbein’s Portrait of Georg Gisze (1532), also known as The Merchant of Danzig, hanging in the entrance hall. The painting, on closer inspection, reveals itself to be watercolour. It is a fake – but not just any fake. It was painted by Princess Victoria, Queen Victoria’s daughter, copied directly from the original in the royal collection. This is not just a novelty either: Victoria was clearly a skilled draughtswoman, and even at close quarters her brushwork is delicate and precise, befitting a princess. Many hours of research have been expended – in vain – attempting to establish the artist responsible for a portrait that hangs nearby. It depicts a grand gentleman in white wig and velvet coat, holding white gloves in one hand. The Resnicks bought it because they fell in love with his imperious (though not unkind) expression; it is undoubtedly an accomplished painting, even if its source remains elusive. Curators Sharon Takeda and Kaye Spilker, from LACMA’s Department of Costumes and Textiles, were summoned by the Resnicks to examine the man’s attire. They pointed out that the gold trim on his jacket was merely inexpensive ribbon, and that his wide cuffs conformed to no particular style. Instead, they concluded, this was a man in a theatrical costume – he could equally be English, French, German or Italian. (Incidentally, the painting of the ‘Chinese Ambassador’ by Barbault is thought to show a French artist in carnival costume.) They remain no closer to an attribution. On a landing halfway up Sunset House’s curving staircase squats a massive silver wine cooler. It is in fact a 19th-century copy of a piece made in 1735 by the German silversmith Charles Frederick Chandler, with ornamentations fashioned by the sculptor John Michael Rysbrack. The craftsmen had set out to make the largest item of solid silver in existence; by the time they’d finished, their aristocratic patron had gambled away his inheritance and they were forced to offer it (with the backing of the British government) as a lottery prize to raise funds for the construction of Westminster Bridge. The winner managed to sell the enormous object to the regent of Russia, and it remained in the Hermitage until 1857, when the recently endowed Victoria and Albert Museum borrowed it along with other silver pieces from the Russian collection. Trompe l’oeil, for instance, was a finely developed technique that found its fullest expression in the Baroque period, and which then, as now, enjoyed a high degree of commercial success. Two large tondos in the Resnicks’ dining room, painted in 1790 by Dirk van der Aa, imitate the blue and white of Wedgwood jasperware. A small painting in the same room, by Jules Léopold Boilly, is a trompe l’oeil rendering of a terracotta relief signed (in clay) by the sculptor Clodion. Next door, an actual terracotta by Clodion, Venus Disarming Cupid (1776), rests on the grand piano. I could not tell you which is more valuable, but the trompe l’oeil, with its hyper-realistic bluebottle resting on Boilly’s crumpled calling card, seemed to me to be infinitely more compelling, and resonant with the house’s skillful faux-stone effects and veneers. Jazzar, indeed, has made an immense contribution to the upgrading of the house’s interiors and external landscaping. His background in architecture and the decorative arts allows him to confidently design and oversee the production of details such as the music room’s Art Deco-style fireplace, veneered in richly patterned Macassar ebony. He shows me an ornately carved English wooden table, topped with a thick slab of black marinace granite. When the Resnicks purchased it, it had a white Carrera marble top, ‘which made the whole piece look so cheap’, according to Jazzar. It was also clearly inauthentic; in 1730 a grand table like this would never have been adorned with such a plain material. Jazzar located the more appropriate slab of fancy stone, but, since the piece was only three quarters of an inch thick, he found a craftsman who ‘folded down’ the edges on all sides to create the illusion of extra thickness. The seam is almost imperceptible. Jazzar notes the number of craftsmen in and around Los Angeles who, contrary to many East-coasters’ expectations, are highly skilled in such traditional techniques. It comes as no surprise that Lynda Resnick herself has a background in interior design. While the house conforms to no single historical style – most of the paintings are from the 18th century, but she admits to disliking most furniture from that period – it is nevertheless aesthetically coherent. Upstairs, the ‘Chinese Bedroom’ contains pre-Revolution Chinese posters, a 19th-century French bed by Gabriel Viardot, an Aesthetic Movement clock, Korean brass lamps, late-19th century, bamboo-patterned jardinières by the Massier brothers, and an Aesthetic Movement table by Edward William Godwin, a promised gift to LACMA. Jazzar says he considers his role as that of ‘the guide, to suggest. And sometimes,’ he adds delicately, ‘to try to insist.’ He never vetoes the Resnicks’ selections, but instead makes careful arguments for or against a particular acquisition. Since very little of the collection is ever in storage, the house is now groaning at the seams. If a new purchase is made, space must be made by deaccessioning something or donating it to a museum.